This may or may not be a Christmas miracle, but spiked water is now available in Philadelphia. Healthy eaters and drinkers rejoiced when low-calorie spiked seltzer hit the market in 2016, but some people have sensitive stomachs that don't do well with carbonation, so this spiked still water should be a dream come true. 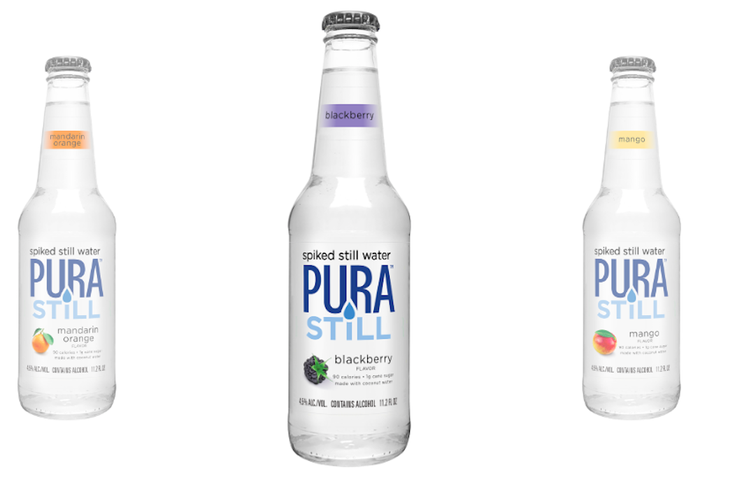 Pura Still comes bottled in three flavors: mandarin orange, blackberry and mango. The product — which rings in around 4.5 percent ABV, has about 90 calories per bottle and only one gram of sugar — rolled out nationwide over the month of December, according to Delish. Pura Still beverages are made of a simple combination of "purified water, malt alcohol base, cane sugar, citric acid, natural flavors, coconut water powder, and sodium benzoate (to preserve flavor)," according to their website. Additionally, the beverage is gluten-free. So, how does plain water become alcoholic, you ask? Well, Pura Still filters fermented malted barley extract and natural sugars into the water and adds natural flavoring, so it really looks like water and tastes like flavored water — but gets you tipsy. "People are prioritizing their health and wellness more than ever," Pura Still brand Jessica Stainsby said in a statement. "Pura Still creates an option for consumers who want to enjoy themselves without worrying about carbonation and bloating, calories, or excess sugar. You shouldn't have to compromise your lifestyle to enjoy a drink." You can find Pura Still at many corner stores, delis and beer aisle around Philadelphia. Check out the specific locations here.